The ability to forecast the time and location of earthquakes remains one of the greatest challenges for geologists. Understanding how continental crust responds to strain is essential to improving earthquake predictions. Using groundbreaking satellite techniques, new research in Tibet suggests continental crust reacts to strain more like toothpaste than rigid blocks of rock. As reported in the July 9 Science, Tim Wright of the University of Oxford and others used interferometric synthetic aperture radar (InSAR) data from the ERS series satellites, operated by the European Space Agency, to measure movement along the Karakoram and Altyn Tagh faults in Western Tibet from 1992 to 1999. In the past, researchers have used InSAR to measure surface ruptures after big earthquakes. Only in the last few years, however, has Wright determined how to measure small surface movements between major earthquakes by using multiple datasets, says Philip England, a co-author also from Oxford. InSAR images like this one are helping researchers understand how continental crust deforms and may eventually lead to better earthquake prevention. The bright colors at the top of the image represent differences in surface elevations, possibly due to earthquakes. Image courtesy European Space Agency. The researchers examined a section of continental crust being squeezed together by the two faults as the Indian plate pushes northward. As the plates come together, the bounded area is extruded eastward, like squeezing ketchup from a packet. The particular geometry of the faults makes this region a prime location to test two competing theories on how continental crust deforms in response to strain. The first theory postulates that Earth's continental crust is made up of many tiny tectonic plates, sometimes called microplates, which deform rigidly. If the Tibetan region deforms rigidly, like a microplate, researchers expect lots of movement on the two faults bounding the region. "In the rigid plate model, the only way to accommodate shortening is to squeeze things out the side," Wright says. The alternative theory suggests continental crust deforms like an extremely viscous fluid. Although rocks in the upper 15 to 20 kilometers of the crust are relatively cold and brittle, rocks heat up and become taffy-like at great depths in the crust, says Wayne Thatcher, a geophysicist at the U.S. Geological Survey in Menlo Park, Calif. If most of the deformation in continental collisions takes place fluidly at great depth, the two surface faults in Tibet should be less active. By measuring relatively slow movement on the two faults, Wright's team says it has refuted the microplate theory. "If these two faults are not absorbing motion now, where is it being absorbed?" England asks. Because there is little movement associated with other faults in the area, deformation is likely occurring fluidly at depth, he says. Previous GPS measurements support the researchers' findings, but England says that there is not enough evidence yet to confirm the squishy-continent theory. To fully understand how continental crust deforms, additional satellite data is needed. "Right now we do not have a dedicated satellite for InSAR," Thatcher says. 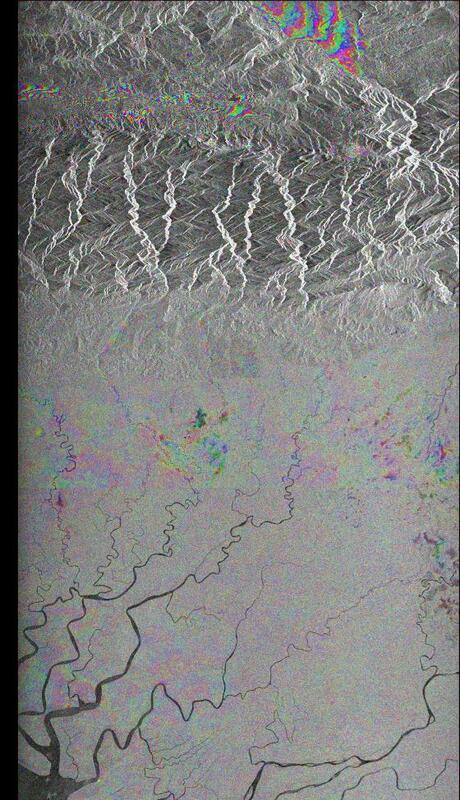 The call for an InSAR-dedicated satellite goes beyond resolving the squishy vs. rigid debate. The techniques and measurements Wright's team used could be incorporated into an earthquake prediction system. "With InSAR and GPS we can look at very wide areas and make a map of the strain of the crust," Wright says. "In seismically active parts of the world, a map of strain would be able to pinpoint where large earthquakes are likely to occur," Thatcher adds. England underscores the point, saying, "as far as solid earth science is concerned, this is one of the most important projects  being able to map strain and find out where unexpected earthquakes are going to occur."